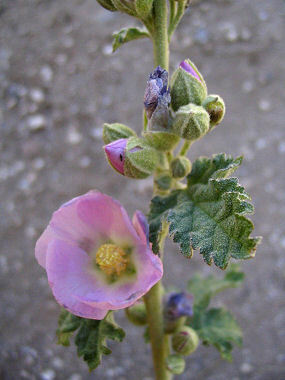 Desert Globemallows are perennial herbs that typically grow in large clumps up to 3 feet in height at elevations below 3,500 feet. You will often see them on the sides of roads, along the banks of washes or in the desert flats. The leaves are gray-green & triangular, with three lobes and scalloped edges. They are covered with tiny hairs (which perhaps evolved to discourage herbivores). Leaf hairs on the globemallow are an eye irritant, which is why they are also known as sore-eye poppies. The plant blooms profusely in the spring and occasionally at other times of year after wet weather. The bright orange flowers (which occasionally come in white, pink, purple or reddish) are 1 ½ inches in diameter, goblet shaped and grow in clusters along the upper stems of the plant. 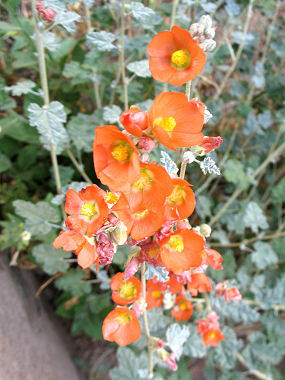 Desert Globemallow are browsed by bighorn sheep and the flowers often attract bees.